A Water-Free, Stable Suspension of 30% Pure L-Ascorbic Acid in Light Silicones Vitamin C is an effective antioxidant and its pure form of L-Ascorbic Acid has been shown to help reverse multiple signs of skin ageing while brightening the skin when applied topically. This water-free formula provides 30% pure L-Ascorbic Acid which remains completely stable due to the absence of water. 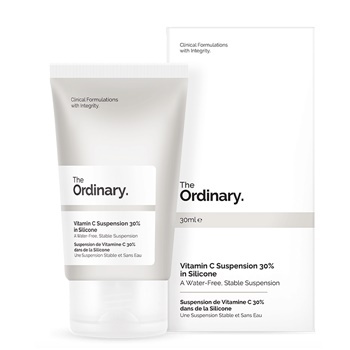 Due to the presence of very light silicones, this formulation feels smooth on the skin despite the suspension format of the formulation, avoiding the short-lived gritty feeling of our original Vitamin C Suspension 23% + HA Spheres 2% formula. This treatment is ideally applied at bedtime. Topical Vitamin C offers a wide array of benefits to the skin. However, many forms of Vitamin C and many more formulations of Vitamin C are available commercially with a potential to confuse the audience. We have developed a guide that offers guidance on the formulations of Vitamin C offered under The Ordinary range. It also offers education on Vitamin C itself and on the differences between formulations of Vitamin C at large. Please click here for this guide. Directions: Apply a small amount to face in the AM or the PM (PM preferred). A tingling sensation can be expected after application. If this sensation is too strong, this formula can be diluted on each application with your favourite serum or cream. A slight tingling sensation for a few seconds but it has a great matte finish, is easy to apply and I can notice a difference. I love it and have just ordered my second one.